Home Are we sitting on a Time Bomb with Fire Risk in Buildings? Are we sitting on a Time Bomb with Fire Risk in Buildings? The Chamber of Construction Industry Sri Lanka (CCISL), as the apex representative body of the construction industry, has organized a seminar on “Fire Risks in High Rise Buildings” on January 29 at the Sri Lanka Foundation Institute from 1.15 pm onwards. Construction industry experts the UK, India and Sri Lanka will make presentations on the fire hazards in buildings especially high rises. Although the construction industry is dubbed as one of the fastest growing sectors in many countries including Sri Lanka, the attention given to some of the key safety issues is quite insignificant. In June 2017, there was a major fire disaster in the 24-storeyed Grenfell Tower building in UK. This fire caused 72 deaths and serious injuries to 70 others. This fire disaster occurred in a much developed country where very high safety standards and stringent building regulations are enforced. 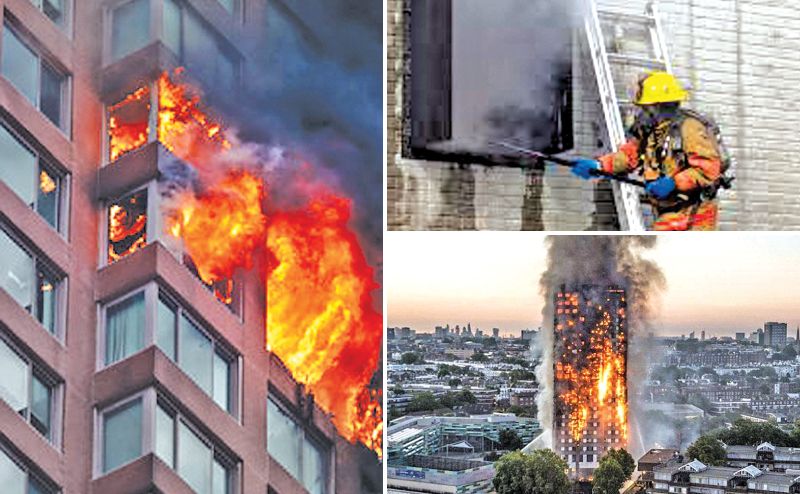 If such a major fire could erupt in a high rise building in a developed country such as the UK, needless to say that it is crucially important to critically look at all aspects of fire safety in our high rise and other buildings. As the Colombo Fire Brigade reportedly has only one aerial ladder that can reach upto 18 floors only for evacuation and fire pumps capable of reaching upto 7 floors only, our high rise buildings could be much vulnerable. Consequently, this has become the need of the hour as we also witnessed few major fires in buildings during the recent past. With nearly 50 high rise tower buildings under construction in and around Colombo, fire safety is of greater significance now. In Sri Lanka which has a poorly equipped fire brigade by international standards and considered somewhat under staffed and lacks quick response, as evidenced in recent Kandy fire disaster, we could very well be sitting on a major disaster in waiting. Many multi storeyed apartment/ office complexes are using light weight partitions and claddings to reduce weight and thus economize on the structural cost. Some of these materials used for partitions, claddings and ceilings are not conforming to the safety standards and are made out of combustible material. Even in Grenfell tower in UK the fire spread very fast due to combustible material in insulation panels. In a developed country such as the UK, where safety standards are very high and monitored stringently if this could happen, can our buildings be assured of fire safety? Learning from past experience on fire disasters in buildings, many countries have imposed several fire safety requirements. These include smoke detectors, fire alarms, fire extinguishers, wet risers, emergency power generators, separate refuge floors, separate storage tank for firefighting, arrangements for quick evacuation, and restriction on use of certain materials, etc. In all major hotels it is a requirement of International Travel Association to have fire drills periodically. But in how many apartment buildings are these being conducted?